I said earlier this year that I was probably going to slow down in 2018 and pursue some other avenues of real estate. But when a deal lands in your lap, you don’t ignore it. And that’s exactly what happened last week. A deal literally fell in my lap. Let me back track a little. I’ve mentioned several times that my dad is not only the Principal Broker and owner of the real estate firm that I work for, but he also owns an accounting firm. And one of his clients came in this tax season and said they wanted to sell a house they owned. They’d done some updating of big ticket items over the years, but not too many cosmetic updates were done. And that’s all music to my ears. So Dad and I did a quick drive by and were intrigued, and then we scheduled an interior showing later in the week. Within 5 minutes of being inside, I knew I wanted to make an offer. By the end of the day, we had negotiated a deal, and it was all in writing by the next morning. It was a fast negotiating period– as all off market listings are. Besides the midcentury character of the home, I was sold on how well they had maintained it over the years. 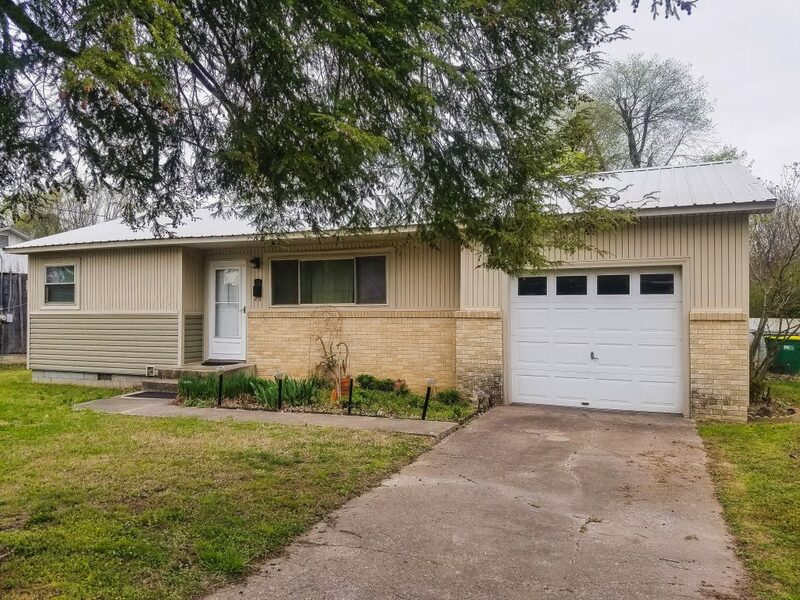 They had recently put on a new metal roof, updated the appliances, replaced the heat and air, installed new windows and siding. All big ticket items I wouldn’t have to tackle! There’s so much to love about this little house. 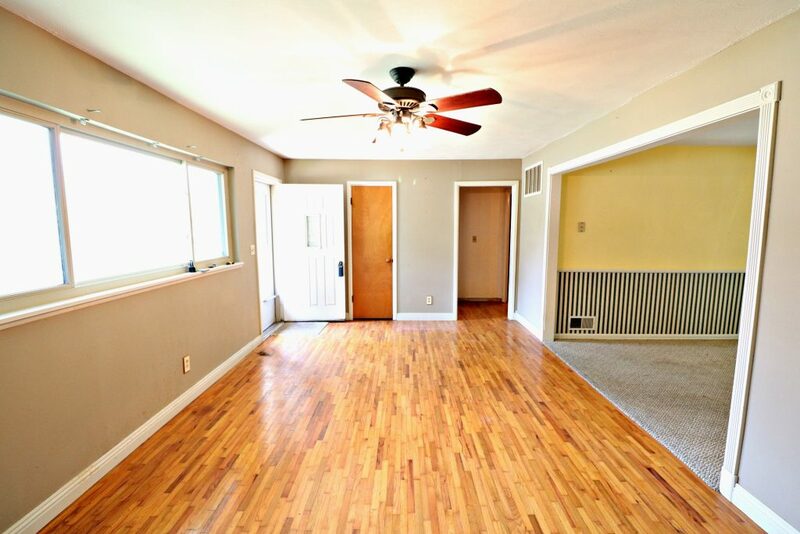 It’s around 1200 square ft, 3 bedrooms, 1.5 bathrooms, and a large fenced in yard. This one should be a lipstick flip like Flip 6, and I hope to be in and out in 2 weeks– barring any surprises. I love to see a house with wood floors, don’t you? And, for the most part, they’re in pretty good shape. From a budget standpoint, this house reminds me a lot of Flip 6. I hope to spend around the same amount, if not a little less. It’s mostly cosmetic issues at this point, so I hope the turn around time is fast too. This one will be priced right smack dab in the middle of the first time home buyer price point that has such fierce competition, so I’m hopeful for a healthy profit. The house isn’t huge– true to its age, but that’s also a good thing for a remodel. I won’t need tons of product and materials to freshen it up. Some flooring, paint, and fixtures is about all I’ll need to get this place looking different. I’ve started a different approach with flipping. I’m partnering with Dad on this one. If you recall, I grew up in this world. I grew up on job sites and sitting (bored) at house flips and forced to help paint at fixer uppers. So it makes complete sense to partner with Dad– he’s seen it all, done it all– and he’s a great resource. I don’t always partner with him, but, for now, it’s a partnership that makes sense. Of course, that does mean I have to split the profits. But in and out in two weeks, it’s still a decent payday! Dad is not at all involved in the design. In fact, he’s awful at design! He really monitors the numbers and liability– the boring, but extremely necessary part. I get to handle the fun part- the design! 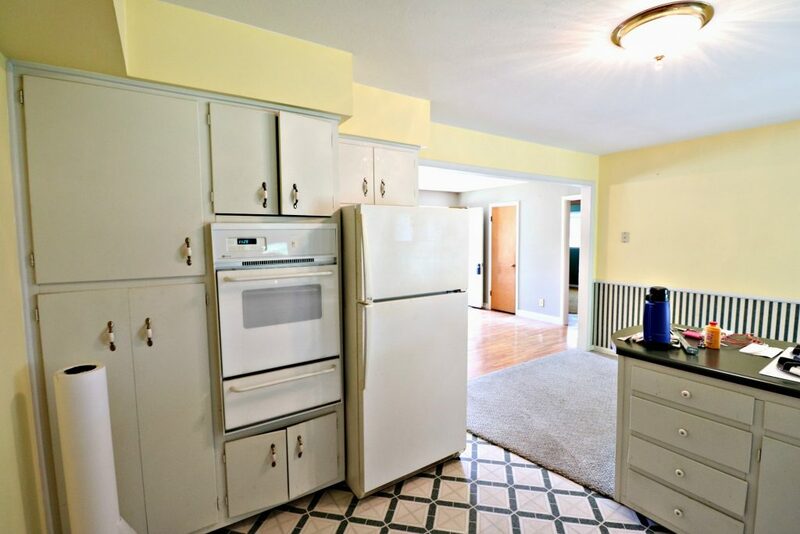 As with most of my flips, I’ll keep what I can- including the kitchen cabinets. Currently, there is no dishwasher, so I will have my cabinet guy reconfigure the current setup to house a dishwasher. And my beloved painter will give the cabinets a fresh coat of paint, and I’ll accent with new hardware. 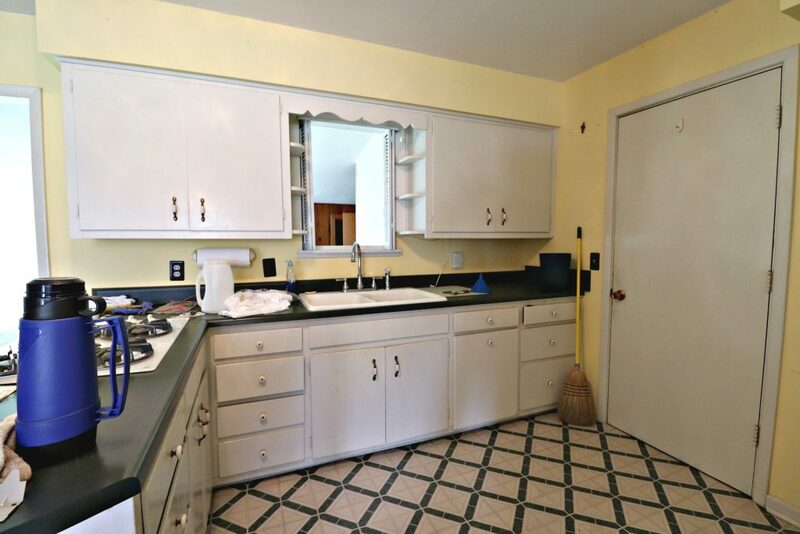 The countertops, a dark hunter green, are staying because of budget. In some light they look black, so I plan on playing off that and hoping to make them look more black than green by incorporating a lot of flat black accents in the design. 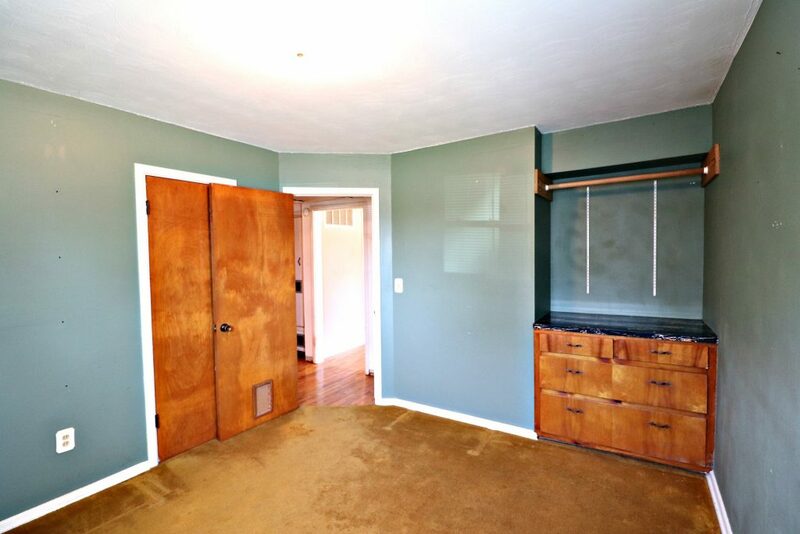 The flooring and wallpaper are also hunter green, and those AREN’T staying! 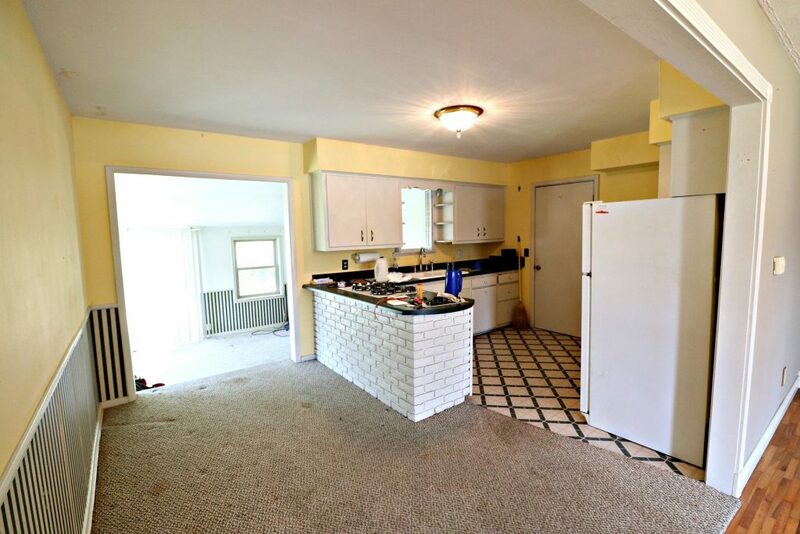 The eat-in kitchen isn’t large, but it’s adequate…and probably the worst place to put carpet! So that’s obviously going. 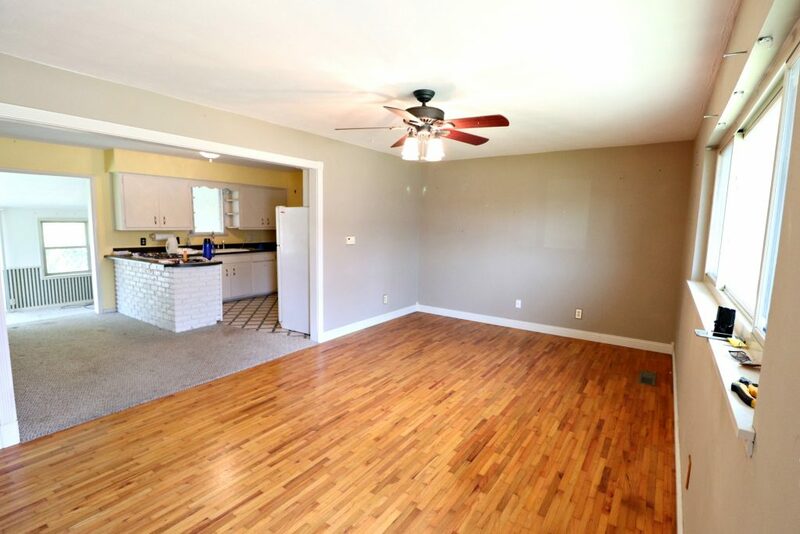 Unfortunately, there are not hardwoods underneath, so I’ll have to come up with a budget friendly floor covering option for the kitchen and eat-in area. The house was originally a 2 bedroom home, and an addition was built at some point to add a 3rd bedroom. 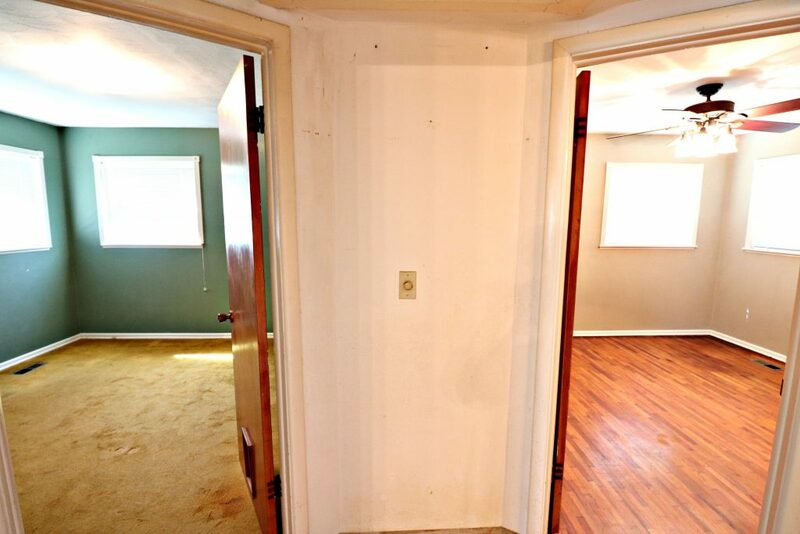 The original two bedrooms will be easy fixes with paint. 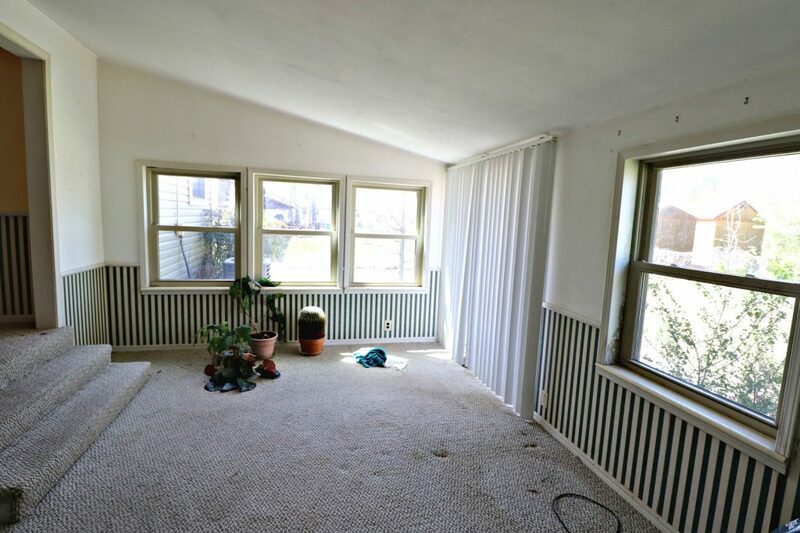 One bedroom has very old and dirty carpet that will be removed to reveal the original hardwoods. I’m still debating on having the floors refinished. 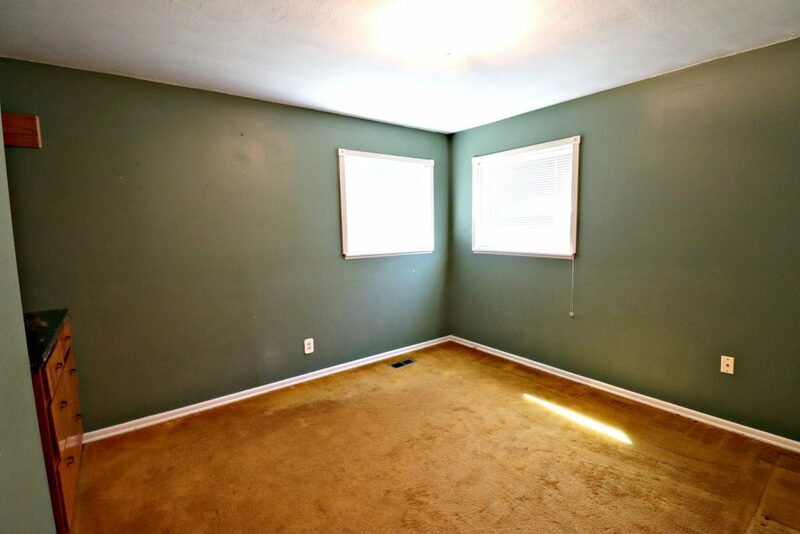 The first room is so dark because of the carpet and green paint. 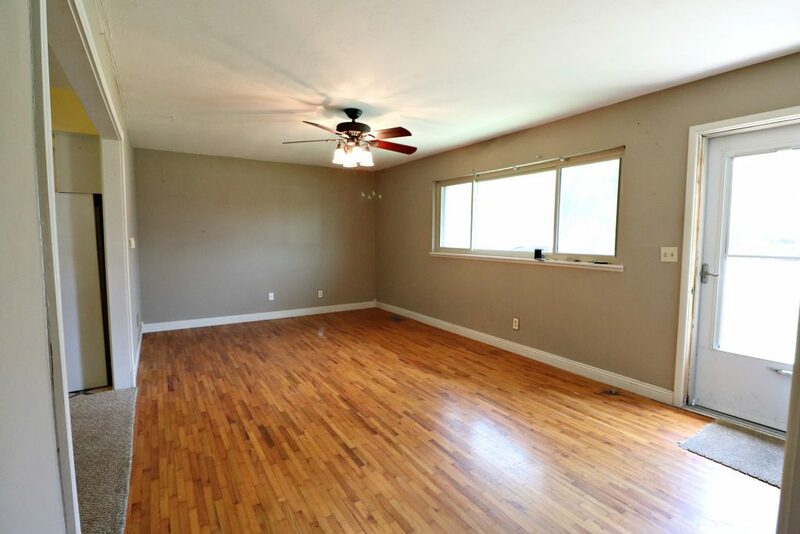 All of the walls in the house will get my favorite gray paint, and once the carpet is removed, I think this room will really shine! 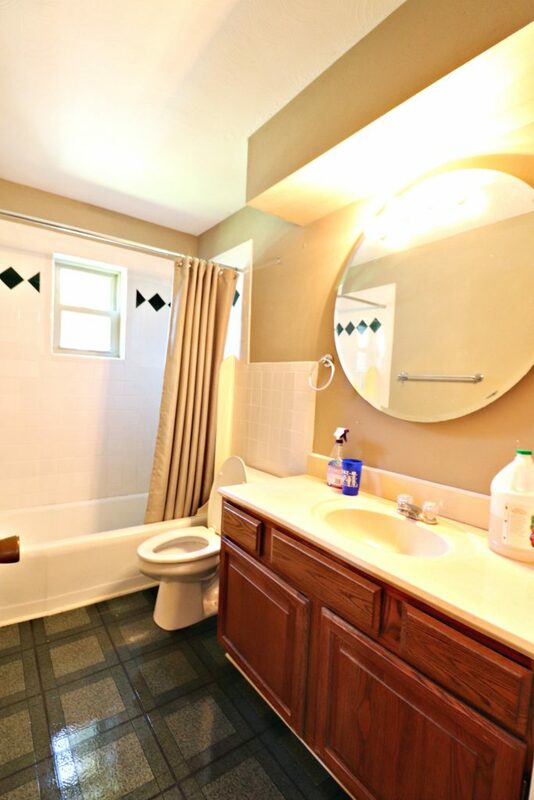 The main bathroom just needs a little freshening up, but the bones are good. The tub and tile are in good shape, so I won’t have to touch those. I’ll keep the existing vanity, and give it a new life with paint, hardware, and a new faucet. The existing mirror has a built-in light fixture (so bizarre…), so I’ll replace the enormous thing with a modern new mirror and separate light fixture. I had plenty of leftover hexagon floor tile from the kitchen reno at Flip 5, so I’m using those leftovers in this little bathroom. The 2nd of the original bedrooms really only needs some fresh paint. Bedrooms don’t typically need a lot of work, so I can typically get by with just paint. The ceiling fan has been updated at some point, so I’ll be doing very little in this space. Apart from the original living room, the addition also provides an additional living area. 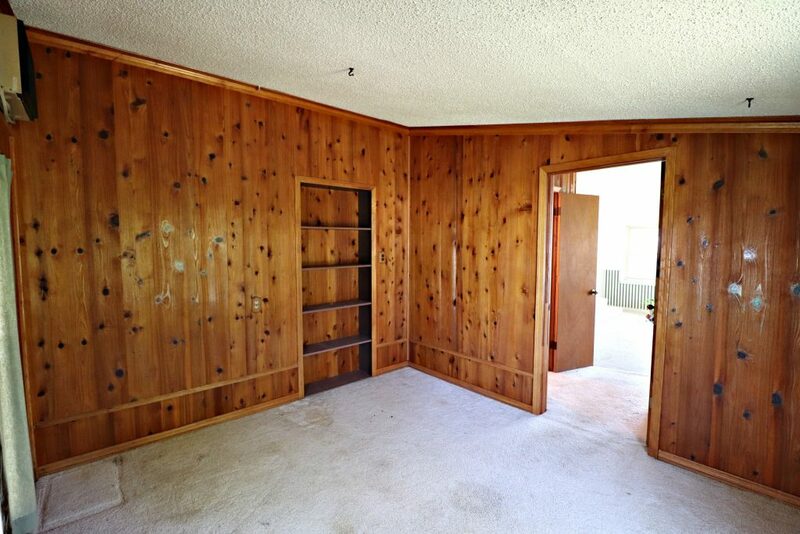 Right now it’s pretty dingy and dated, but once the wallpaper is gone and the stained carpet removed, this room won’t look the same. I’ll be using a vinyl plank on all of the flooring in the addition. I’m a big fan of vinyl plank because of its price, durability, and design. The addition is not heated and cooled as part of the central HVAC, but it is counted in the square footage because of auxiliary heating/cooling methods. I am, however, going to have ducts ran out here to include in the central heat/air. In the middle of August or in the depths of winter, accessory heating/cooling units don’t always get the job done. While that’s an expense that doesn’t add beauty to the room, I think it adds a sell-ability factor to the home. The addition houses a half bath, and it will literally be gutted. 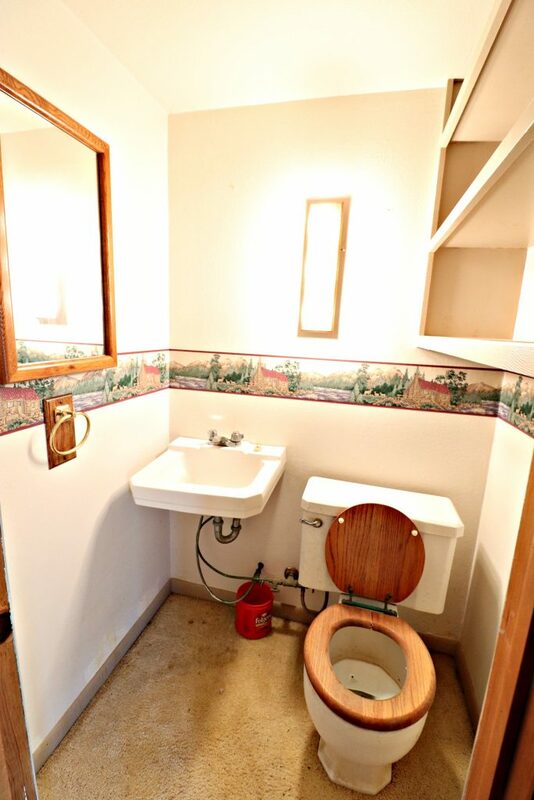 The carpet, the toilet, the vanity, the light, and the shelf will all be removed. 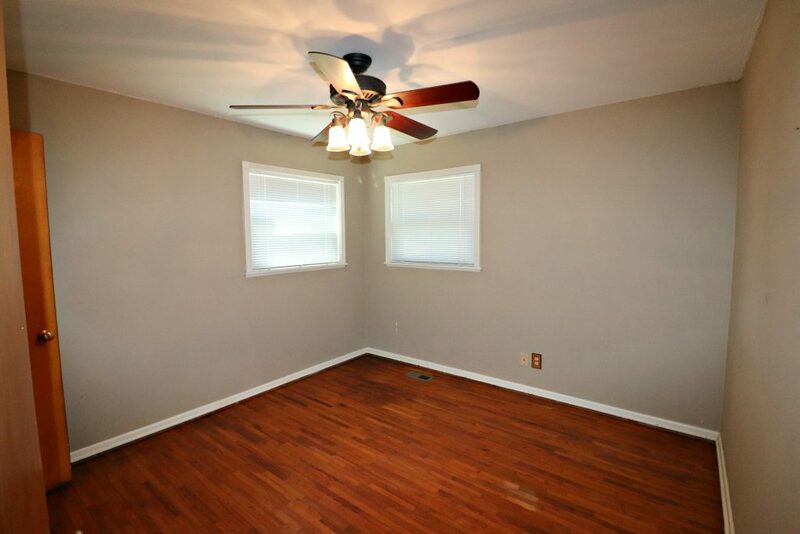 I have a budget friendly design planned for this room…starting with actually putting a light switch in the room! The 3rd and final bedroom is a little odd. There is no light fixture or fan in the room currently. And I technically can’t count it as a bedroom because there isn’t a closet. So I’ll be adding a light and bumping out that built-in to create a closet. 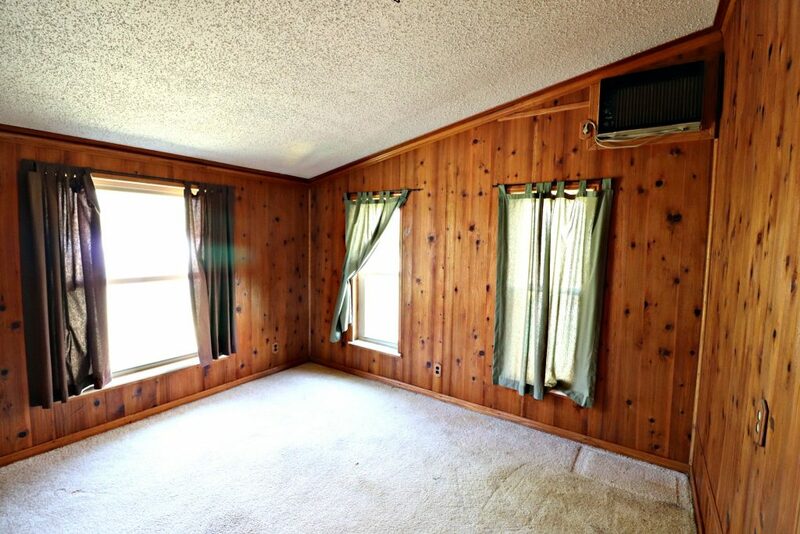 As for the cabin-like paneling, it’ll get a coat of white wash to create a more light and bright space. And, of course, the dated carpet is going too! As you can see, the bones of this place are good. While dated, it’s been well cared for. Yes, it shows its age in some places, but that’s where the opportunity lies. I’m eager to get my hands on this one– and get it finished! I close on this house on Wednesday, and works start immediately! Here’s to a fast & furious turn around! Absolutely excited to see what you do here! You’ve mentioned flip 7 a few times and here she is! You will do your dad proud. Thanks Jina! Excited about this one! Looks like a great buy! Are you going to do anything about the popcorn ceilings? 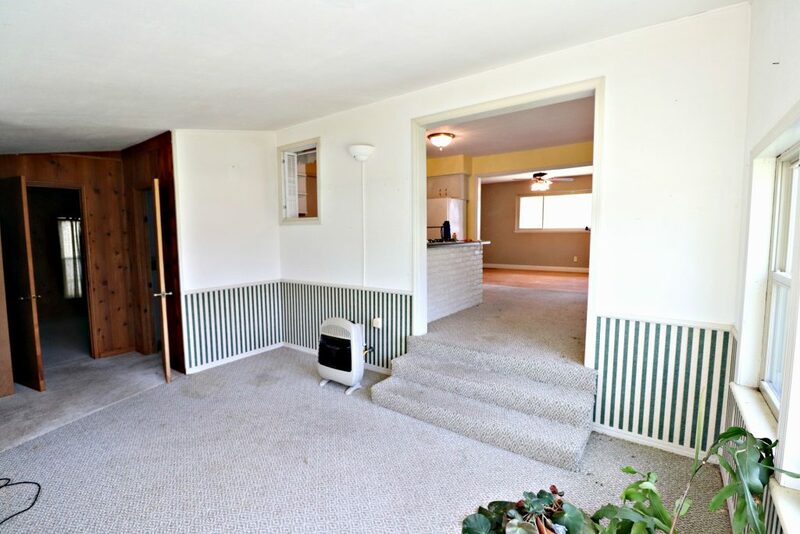 There is only popcorn in one bedroom in the addition. At this price point, I’ll leave it. A higher price point, I would have scraped it. Luckily it’s only one room! What a find ! 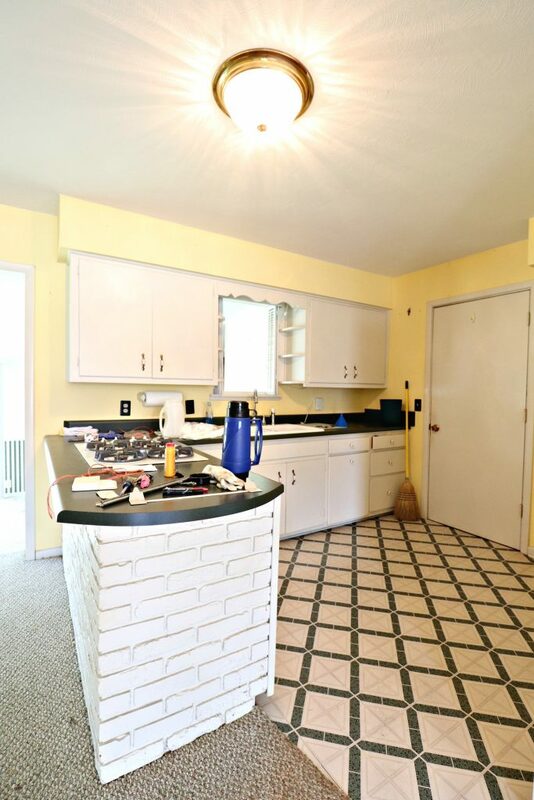 I’m eager to see what you have in mind for that wretched little 1/2 bath, which desperately needs your special touch – a budget friendly designer make-over. 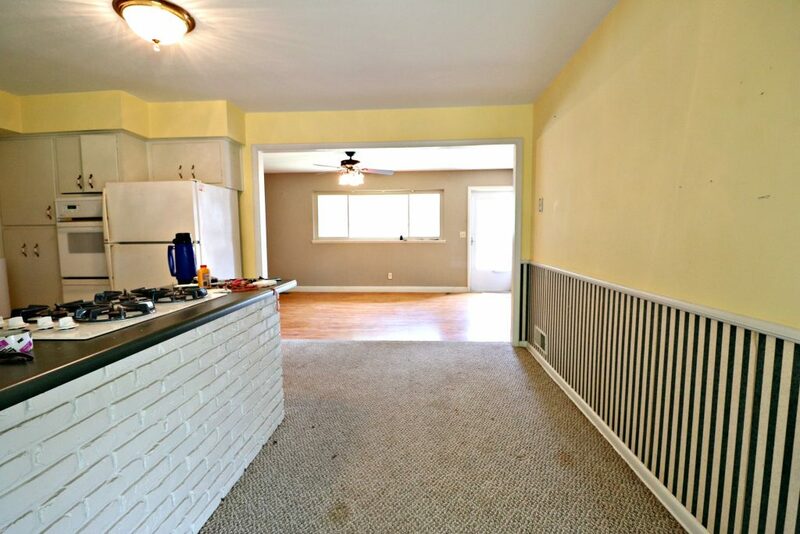 I have to agree with your decision on adding vinyl plank flooring in the addition. Have you considered extending it into the kitchen and it’s eating area as well ? At first I was a doubter, as we’ve always had a combination of hardwood and ceramic tile floors, both here and at our lake-house, but after seeing this flooring installed in a friend’s several rental properties, I was smitten – not just with the look, but how well it has held up with various occupants and their pets over several years. I wanted a low maintenance, waterproof floor which negated pine, hardwood, engineered wood or laminates, so we decided to try the vinyl plank flooring throughout our entire new build and it looks terrific. We opted not to try to mimic ‘real wood’ so chose instead a greyish toned aged barnwood style called Longview Pine (d/k the manufacturer) and at less than $5/sq.ft. (installed) it was a bargain, looks great and is completely waterproof – something both he and I wanted as we tend to track a lot of the ‘outside’ inside when mowing or working on the landscaping projects. The builder was equally pleased with the result and has since brought several clients over to see the finished product and I must say, this flooring sells itself ! 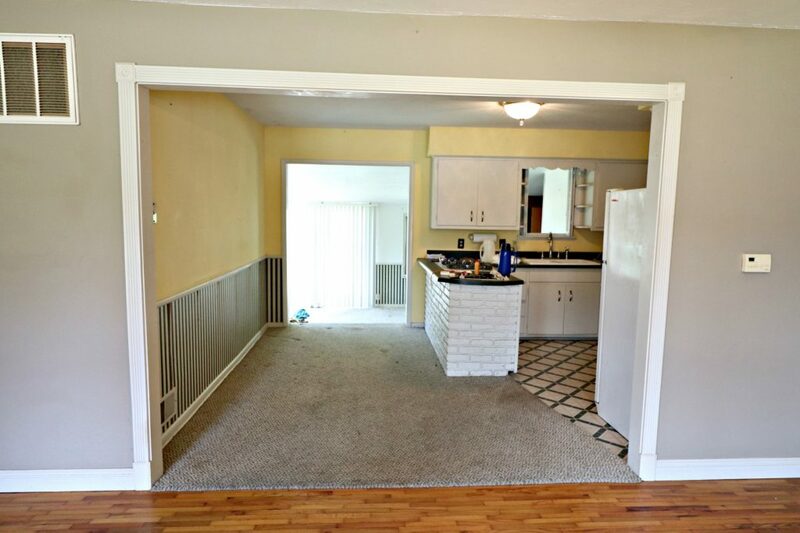 I’m eagerly waiting for photos as you start this flip. It’s going to be a cute starter home for some lucky folks. Good luck ! We have had SEVERAL conversations about the floor covering. While the plank makes the most since, it’ll but up next to actual hard woods. So I’m a little hesitant to put faux wood grain next to real wood grain. As always though, budget will determine what actually happens! That knotty pine is to die for. How lucky you are!! Instead of painting it, I’d white wash it to do the “modern farmhouse” look that’s so popular now. Great hardwoods that are really wood and not just half an inch thick, too. They don’t make houses like this very much anymore. 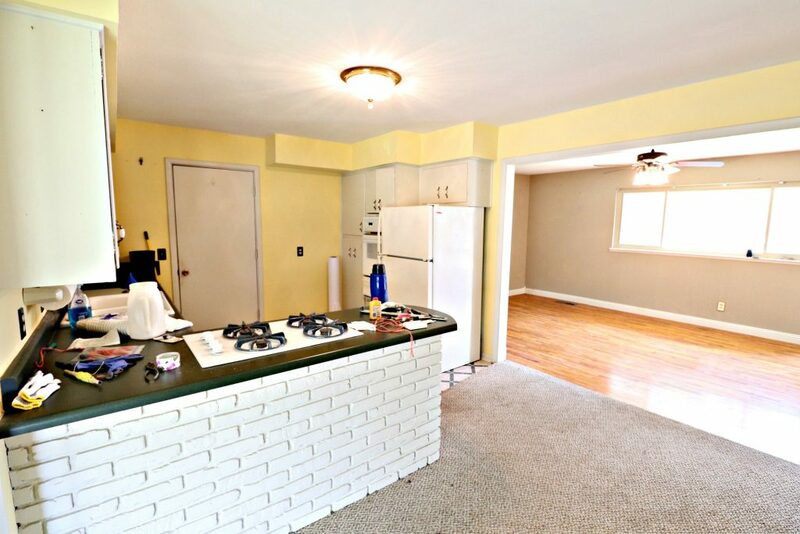 Also perfect for those downsizing, but they want good finishes, and those countertops wouldn’t do for my friends. Anyway, can’t wait to see what you do. I imagine it will be filled with light! How funny you should say that about the knotty pine! I’m doing exactly that…white washing it!